Fiji Water - Is it safe to drink? There are two types of water in Fiji, Fiji water and Fiji Water. The one with a capital 'W' is, as I'm sure most people are aware, the fancy American bottled water company (sometimes misspelt Figi Water). For information on that, refer to our Fiji bottled water section. cry from the fancy bottled Fiji Water which they don't have access to. Suva, it's not recommended that you drink tap water. Often, the resorts will supply you with bottled water. With typhoid outbreaks in 2009 and 2010 caused by poor water supply, the Fiji government had to put forth a huge vaccination program. Sadly, several deaths on the outer islands were blamed on the outbreaks. One could say that the average American has more access to Fiji's water than the average Fijian. It's sad when you think about it like that. How can an estimated 3.5 million litres a month get shipped to western markets, yet most of the Fiji population doesn't get access to safe clean drinking water? 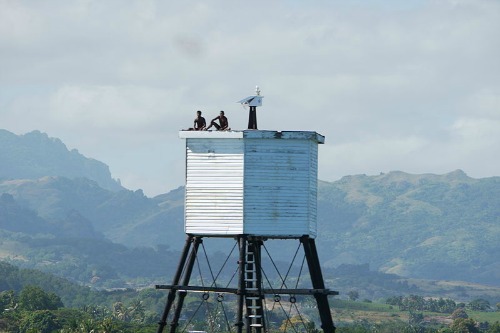 The high quality water in the 27-kilometer long vast artesian aquifer beneath the Yaqara Valley on the main island of Viti Levu, isn't tapped for the local population. The government doesn't have the infrastucture or means (maybe the nice bolster of tax from the Fiji bottled Water company can help) to provide clean water. Often the water supply gets contaminated from heavy rains and also Fijians have to contend with broken or cracked pipes. Officially, mainland resorts and the towns of Suva and Nadi have drinkable tap water. However, I'm sure the average Fijian will tell you it's not safe for visitors. The farther you are away from the mainland and mainland resorts, the more chance the water is unsafe for drinking. Resorts, especially isolated ones, go that step further to make sure it's clients get safe drinking water especially if it's from a water tank. That said, they probably still provide you with bottled water, which should be used for drinking and, especially for the out-of-the-way places, for brushing your teeth.